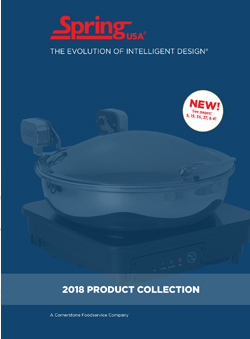 With our exclusive design, superior quality, impeccable workmanship and unique detail, the Spring USA Breakfast Collection meets the demands of the world’s top professionals. 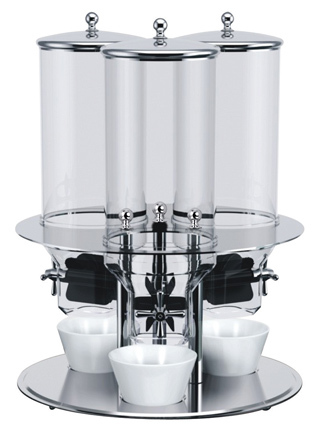 18/10 Stainless Steel Beverage Dispenser with ice tube. Has a 7 liter capacity (7.71 quart, or 2 gallon). Height: 25″, Diameter: 6-1/2″. Vessel has an 8″ diameter. Part of the Spring USA Breakfast Collection line. Unit is NSF Approved! Benefits of our 7-liter capacity juice dispenser? The unit has a dedicated ice tube ~ beverages stay cold, without the worry of melting ice to dilute the contents of the vessel. Features the Spring USA faucet, forged of 18/10 stainless steel. The unique design of this faucet, is its pulp-cleaning valve. Polycarbonate cylinder can be ordered separately, as can the nozzle/faucet. A must have for any buffet! This is our 4-Liter Beverage/Juice Dispenser (holds 1 gallon). Unit stands 22″ inches tall. Features the Spring USA 18/10, stainless steel faucet, along with our stain-resistant, polycarbonate vessel. Unit is NSF Approved! Diameter of the vessel is 6-1/2″ inches. Additional benefits of this unit? Faucet has a special Pulp Cleaning Valve, for easy clean out. Polycarbonate vessel is stain resistant. Unit has stabilizing legs ~ won’t tip or wobble. Replacement parts can be ordered (acrylic vessel as well as the stainless steel faucet). Beverage/Juice Dispenser, 7-liter capacity(7.71 quart or 2 gallon capacity), 18/10 stainless steel, with oblong base, drip tray and ice tube. Unit stands 25″ tall, stainless steel base measures 8-7/8″ x 13-3/4″. Unit is NSF approved! Durable polycarbonate vessel is stain resistant. Replacement small cover that goes on the ice tube is Item #511-61. Serving glasses that are 7″ or smaller work best with this faucet & tray configuration. Another member of the ‘Breakfast Collection’ lineup. 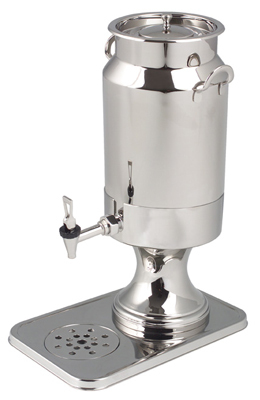 Milk Dispenser with drain base, 18/10 mirror-polished stainless steel, 5-1/4 quart capacity. Unit stands 18-1/2″ tall x 7″ diameter. The base measures 9″wide x 14″ long. Milk Can can be purchased separately, without the drain base ~ See Item #528-66/5. The milk can, on its own, measures 12-1/2″ tall & is 7″ in diameter. Replacement drain (with holes) is Item # 525-5/7. Replacement Cup (that rests under the drain) is Item # 526-5/7. The milk dispenser features the Spring USA faucet ~ forged of 18/10 stainless steel. Replacement faucets can be ordered ~ Refer to Item #528-05S. Replacement ice tubes can be ordered – Refer to Item # 528-IT. Looking for Coffee Urns…? Click Here. Part of the Spring USA Breakfast Collection. Cereal Dispenser with drain base. 18/10 mirror-polished, stainless steel. Unit holds 7-1/2 quarts of cereal and stands 27-5/8″ tall. Unit can also be used to dispense candy, trail mix, nuts or anything else you can think of! The base is 9″ wide and measures 13″ front to back. The diameter of the vessel is 7-1/2″. Our Cereal Dispenser is NSF approved! A new addition to the Spring USA Breakfast Collection! Single Snack/Cereal Dispenser durable, polycarbonate cylinder has a 10-liter capacity and stands 27″ tall. Use to dispense candy, trail mix, granola, nuts or anything else you can think of! The base is 12-1/2″ wide side to side. The polycarbonate vessels each measure 22-3/4″ around. Double your offerings! Our Double Snack/Cereal Dispenser has a 10-liter capacity, per polycarbonate vessel. Unit stands 27″ tall. Elegant design with an airy appearance. Use to dispense candy, trail mix, nuts or anything else you can think of! The base measures 25″ side to side. Each polycarbonate vessel measures 22-3/4″ around. New addition to the Spring USA Breakfast Collection. 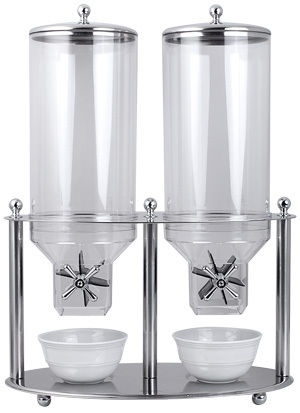 Triple Snack/Cereal Dispenser with convenient, rotating chassis for easy dispensing! Each durable, polycarbonate cylinder holds 10 liters (10-1/2 Quarts) of cereal. The width of the unit is 19-1/2″. The height of the overall unit (including the knobs on the covers) stands @ 27″. Each polycarbonate vessel measures 22-3/4″ around. There is 4-1/2″ from the base of the unit, to the bottom of the dispensing wheel. Dispensing wheel allows Customers access to their favorite snack or cereal.